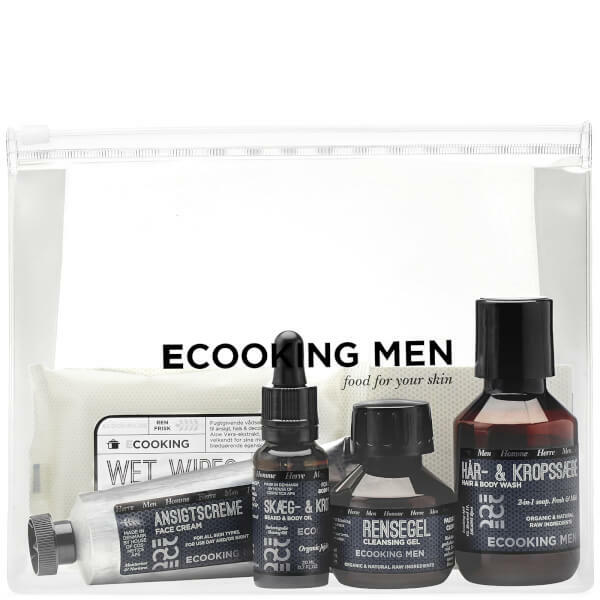 The Ecooking Men Starter Set has been carefully curated to include everything a man needs to form the perfect daily skin regime. Each formula contains organic and natural ingredients to leave skin and hair feeling refreshed and nourished. A moisturiser made with a blend of organic and natural raw ingredients. Suitable for use both day and night, the non-greasy face cream absorbs quickly into skin, moisturising and nourishing to leave the complexion feeling soft and comfortable. Enriched with Organic Aloe Vera, Organic Vitamin E and Organic Sunflower Oil, the moisturiser will help to improve the feel of skin's surface. Infused with a fresh Lemon fragrance. Suitable for all skin types. A multi-functional body oil for men; use it as a body oil, for shaving or for beard care. Formulated with organic and natural raw ingredients, the multi-tasking oil is perfect for adding moisture and shine to beards, as a serum before facial cream and even as a massage and cuticle oil. Offering a multitude of uses, it will nourish and soften the skin and hair, helping to relieve dry, flaky scalps. Can even be used in the bath tub or footbath. Infused with a fresh Lemon scent. A gentle face and body wash formulated with natural and organic ingredients. Gentle and hydrating, the shower gel performs a deep cleanse to eliminate impurities and has anti-bacterial properties to prevent body odour. Nourishing, moisturising and cleansing all-in-one, the formula contains a cocktail of organic Cucumber extract, organic Sunflower Oil and organic Vitamin E to leave skin feeling fresh and protected. Infused with a fresh and mild Lemon scent. A 2-in-1 cleanser for the hair and body. Formulated with a cocktail of beneficial ingredients, including moisturising organic Aloe Vera and organic Glycerin, the hair and body shampoo effectively cleanses and nourishes to leave the skin and hair feeling purified and energised. Its dose of Hydrolyzed Wheat Protein adds shine to the hair while protecting against irritation on skin and scalp. Also contains Organic Abyssinian Oil to help strengthen hair and improve elasticity and density. Suitable for all skin types. Face Cream: Apply the cream evenly onto the face and neck. Beard & Body Oil: Remember to always dampen your hair/skin before applying in order for the oil to be absorbed faster and better. Shaving step-by-step: Dampen the skin. Apply oil to the area you wish to shave. Shave. Finish with facial cream after shaving. Cleansing Gel: Foam up the Cleansing Gel and apply gently onto your face and neck – morning and night. The Cleansing Gel nourishes, moisturises and cleanses your skin in depth. Suitable for normal and greasy skin. Remove with lukewarm water. Hair & Body Wash: May be used daily both as hair and body shampoo. Rinse off all remains of soap with water. May be used on all skin and hair types. Face Cream: Aqua, Aloe barbadensis Leaf Extract*, Glycerin*, Cetearyl Ethylhexanoate, Sodium Acrylates/Beheneth-25 Methacrylate Crosspolymer, Hydrogenated Polydecene, Sodium Benzoate, Parfum, Sodium Levulinate, Xanthan Gum, Tocopherol**, Potassium Sorbate, Lauryl Glucoside, Citric Acid, Phenoxyethanol, Caprylyl Glycol, Helianthus Annuus Seed Oil*, Ethylhexylglycerin, Sodium Hyaluronate, Glucose, CI 42900, CI 19140, Carrageenan. Beard & Body Oil: Sesamum Indicum Seed Oil*, Prunus Armeniaca Seed Oil*, Simmondsia Chinensis Seed Oil*, Argania Spinosa Seed Oil*, Parfum**. Cleansing Gel: Aloe barbadensis Leaf Extract*, Aloe Vera Leaf Water*, Aqua**, Sodium Cocoyl Glutamate, Cocamidopropyl Betaine, Cucumis Sativus Fruit*, Glycerin*, Acrylates Copolymer, Phenoxyethanol, Cucumis Sativus Fruit Extract**, Citric Acid, Parfum, Octane-1,2-diole, Sodium Benzoate, Tocopherol**, Helianthus Annuus Seed Oil**, Potassium Sorbate, Sodium Hydroxide. Hair & Body Wash: Aqua**, Aloe barbadensis Leaf Extract*, Sodium Laureth Sulfate, Cocamidopropyl Betaine**, Polyquaternium-47, Sodium Cocoyl Glutamate**, C12-15 Pareth-12, Phenoxyethanol, Glycerin*, Sodium Chloride, Sodium PCA**, Hydrolyzed Wheat Protein**, Parfum**, Citric Acid, Caprylyl Glycol, Potassium Sorbate, Sodium Benzoate.